Here's a buzzworthy Friday-afternoon topic: Google announced on its blog that it has traded in lawn mowers for grass-chewing goats at its Mountain View headquarters in California. "No 'kidding,'" the post says. The post is getting a lot of talk on Twitter (check that out here), but it's not a new idea. 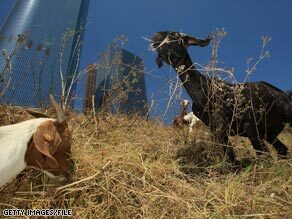 The city of Los Angeles hired goats to gnaw down some of its brush. The goats don't burn fossil fuels and, as Google says, don't cost too much either. Google is renting the goats from a company called California Grazing . Apparently, every so often a herder will bring about 200 of them to the campus and they’ll roam around for a week eating the grass. Not only that, these goats will fertilize the land at the same time — yes, that way. Said with considerable experience after my goats ate my fruit trees rather than my shaggy lawn. Okay this is a genius idea Google; but I wouldn't expect anything less from you guys. Goats ARE cuter than lawn mowers! Cute, but won't the goats create a lot of methane – which is a far more damaging greenhouse gas than CO2? I think this is great. If we begin to see more things like this across the nation then having a green mindset will become more entrenched especially in the young. 1. It takes gas to get the goats there. 200 goats won't show up on a single truck, either, try 3 or more. Not quite low carbon. 2. It's pretty sorry fertilization, though this is more for humor's sake. You'll have a nice spotty yard, the same way the grass always grows greener over the septic tank...you'll have spots of fertilized grass. Also, asthetically, I doubt the freshly mowed lawn is evenly trimmed. "Missed a spot!" probably won't work with them. 3. They only stick around for a week. So, eliminating the grass occasionally as Google needed works, but as a permanent mowing replacement: nope. 4. Many green activists warn against significant animal farming because of the amount of methane released by them. And that's not released through their pores. The question remains: how many people praised Google for their earth friendly actions? When you look at the reasons above, it's not so earth friendly. For fun, it's got a lot of merit. It's the subtle, self-praise for being low-carbon that bothers me. My brother could do this. I will have to recommend it to him. I've seen sheep used locally for the same thing. Great idea. Someone needs to tell California Grazing that their 'contact us' link is broken. I suggested this to my husband a few months ago...I think it is a great idea..Google-where ideas are put into action! I remember visiting my Alabama Grandma, she would borrow the neighbors goat, stake it out in the front yard and let it do what it did naturally. She never did own a lawnmower, that was over 30 years ago. I hope they figure out that goats don't really like to eat grass. Goats will eat the weeds, shrubs and tree bark before they will touch grass. Maybe they should have gone for sheep instead. What about the methane that depletes the atmosphere? Rainer: you missed a couple of important points. Goats like to eat stuff. Their diet is varied and grass is only a small part of it, so you can kiss your shrubs, trees (they'll eat the bark off them) flowers and occasional clothing items goodbye. Also, anyone entering their domain is likely to be subjected to a headbutt, which can result in personal injury. Good ideas are a dime a dozen. Making a good idea actually work often takes genius. What a great way to be green! 1. Your point about gas for transportation is invalid because the lawnmowers (people and vehicles) need to be transported as well. I'd call that a wash. The goats do not use gas to operate, so that is a win in the goat column. 4. Your point about activists warning of animal methane emission is invalid because these animals exist with or without Google's employment, and they are going to release methane whether they are gardening or just living. Lawnmowers on the other hand are a choice and do not have to be used. I concur with Ranier's comments wholeheartedly....nice top-line PR but the reality of the environmental impact is much more spotty. I would be quite interested to know if anybody at Google even thought about doing some sort of net-net analysis on the fossil fuel consumption and carbon footprint of trucking these goats around compared to the current lawn mowing regimen. Google could just have made it a corporate policy to let their campus grow "au-natural" and completely dispense with the process. Or, if they are completely committed to this, let the goats live on the Google campus instead of shipping them in. Wait until one of these things butts an employee. In our lawsuit happy society, Google will get hit with a big lawsuit. Goats are browsers, that is they eat brush, shrubs, weeds and tree bark and branches. (Keep them away from valuable trees.) The picture shows them eating in dense brush. This is precisely what they're good at. If you want your lawn mowed a sheep works better. In many parts of California the brush needs to be removed because of the fire hazard, among other reasons. What needs to be factored into the equation is the potential value of the meat and milk that would also be produced, and the fact that the animals themselves reproduce themselves. I've never seen a lawmower reproduce itself. Also consider not just the carbon footprint of running a lawmower, but the additional cost of it's production and eventual disposal. Yes, the goats (and/or sheep) would be best raised on-site. I love the naysayers raining on the parade here. – This could be done in conjunction with livestock practices. Graze the animals on multiple landscapes until slaughter time, while simultaneously breeding for the next batch of "mowers"
Etc etc etc. You naysayers kill me. You only complain about pollution if it's caused by some method outside the extant status quo. You're okay with swelling landfills, toxic drinking water and polluted air until an electric car or wind-powered generator or alternative lawn care method is proposed... then suddenly you're a newly converted environmental zealot. There would, probably, be more consistent "mowing" and fertilization AND a lack of fuel burned for transportation costs, if they would just build a barn, out back, for a smaller herd, perhaps the sheep rather than the goats, and let the graze there all the time. Maybe that's being considered. Whenever a company tries to do something good, there always has to be someone who has something negative to say. Thats what brings us down, we need to think positive instead of putting down when a company tries to do something good for the enviorment or community. You know... from the fertilizer side. I have to agree with many of the points about the trade-offs of this approach; yes it's more fun to watch goats eating the grass than listening to the gas mowers power their way through it, the fertilizer point is funny but not really effective. I think they'd be better served by using push mowers. Pay employees or others that might be willing to go cut grass during their lunch hour. No carbon emissions, no goat transport, looks much better, provides exercise and income for people, and nowhere near as loud as power equipment, etc. So what if you take the goats to the grazing location by truck, bus or helicopter. It's one trip to drop them off, and then they are off and grazing vs. having the tractor or lawn mower there every week / other week. As a nation that prides ourselves having the smartest and brightest, we can sometimes be very short-sighted. And for this reason, a tiny country like Denmark out shines us in technology and renewable energy. Why does everybody keep bringing up methane gas. The animals are going to eat one way or another whether it be Google's yard or in some farm and they will release the gas. It's not like we can we're just going to kill all the animals on earth because they make the gas just the same way we wouldn't stop breathing to stop carbon dioxide production. There's way better things to be worrying about in regards to global warming than goat's methane production.